As you guys know, we are huge fans of Windows customization. We loved the Themes feature in Windows 7 so much we decided to create themes for our blog readers, who like customization as much as we do. Themes are a great way for a personalized experience on your computer. But customization in Windows 7 is not limited to themes, there are few other things that can be personalized. One of them is your Windows Logon Screen – where you input your Windows Username and password. With this nifty little program called “Logon Screen” we can change that background to anything we like. 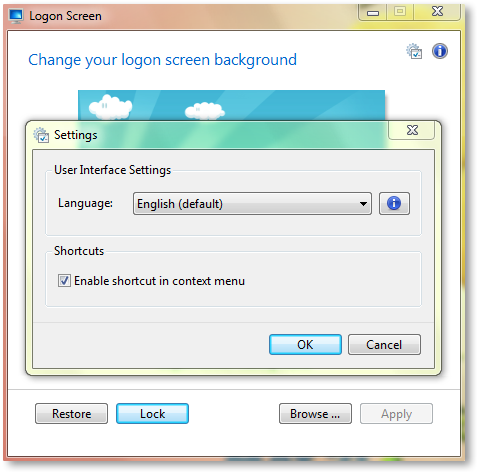 Logon Screen is a small and simple program that will help you change your Windows 7 logon screen background with a push of a button. One point that makes this application different from other Logon Screen changers applications is the ability to integrate with the Windows 7 context menu. This integration is optional and can be turned off if needed. Download (link below) and installation is simple and straightforward. Once installed you can access it by right clicking on your desktop screen. This is the default view of Logon Screen program. It shows the default background image of Windows logon screen. You can click on browse and select any background wallpaper you like. Click on the “browse” button and select any image you like. Once selected, click on “Apply” to apply it on the Logon Screen. If the image is too big to be applied on the logon screen the program would resize it accordingly. Click on “Yes” to resize and apply. You can then click on the “Lock” button to check how the logon screen looks. Don’t like what you see? Just click on “Restore” to restore to the default background, or you can choose another background image. The option to change the Logon Screen background image is integrated in the right-click menu on desktop, along with personalization option. This is for a quick access to checking the Logon Screen background. Don’t want it in the menu? Just click on setting option at top right of Logon Screen Window and uncheck the option to show this in context menu. Logon Screen does its job quite well. 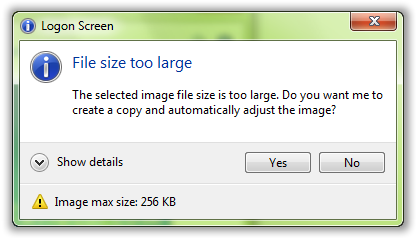 It even resizes the images if they are big in size, and doesn’t outright reject them as being too big or too wide. It also has the option to be included in the context menu, which makes accessing it much more easy. Changing Desktop Background images can’t be more convenient than this and Logon Screen does its job perfectly. For Customizing Windows 7, Check out our Windows 7 Themes Gallery.